The lifeboats are going to be done later. The funnels were quite straight forward, but there are a couple of tricks that made life easier. Marking the holes for the eyes. The eyes need to be 23.5mm down from the top of the funnel, and evenly spaced. I used a Post-it note !! First, take your Post-it, and draw a line 23.5mm from the top. Now wrap the Post-it around the top of the funnel and mark a mark at the front and rear of the funnel. Now you can remove the Post-it, put it flat on a table, and measure the distance between the marks. Divide this by 7, and mark 6 points on the line, evenly spaced. Mine came out at a distance of 5mm, but yours might be slightly different. Now put the Post-it back on the funnel, lining it up with the top accurately, and push a needle through each point to mark the position of the eyes. It's best to use a fresh Post-it for each funnel as they might be slightly different sizes. Finally, drill small holes (you can get a 0.6mm drill from places that sell Dremel style tools) and Superglue the eyes in place. 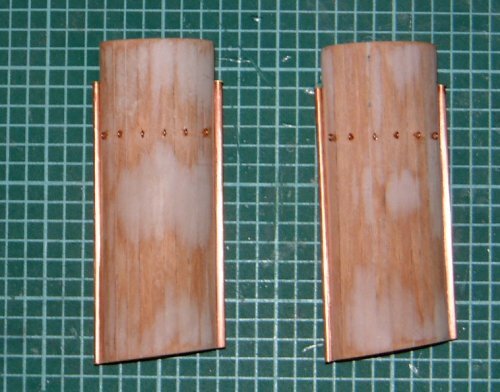 The copper pipes were very easy. I cut them by rolling them with a craft knife, and gave them a sand all over with 1000 grit wet'n'dry paper which will give the paint and glue a better key. Note that I haven't painted anything yet. I'm going to wait until the funnels are more or less complete before painting them as I only want to do it once. Paper templates are very useful tools for getting things evenly spaced. Note: The running total will be updates once I've completed some of the outstanding tasks.